Complete, bigger&better scans of the same comic uploaded 5 years ago. Cover (1 page) Phantom Guardians of the Enchanted Lake! Synopsis: Treasure hunter Luca works with witch doctor Lago to discover the location of a tribe's hidden jewels. Determining that the jewels are located in the river bed, they dam the river, causing drought in Kaänga's jungle. Kaänga and N'geeso destroy the dam and both Luca and Lago are drowned. Synopsis: An albino elephant denies Simba's authority over him. Soon the elephant's herd expels him because of his coloring. But when the entire herd is threatened by ivory hunters, the albino and Simba join forces to save the herd and the exile is allowed to rejoin the herd, and he acknowledges Simba's rule of the jungle. Synopsis: Terry pursues the treasure hunter King Cobra. Cobra is a master of disguise, but Terry turns the tables and disguises himself as Cobra to infiltrate Cobra's operation. With the arrival of the lancers Cobra's men are defeated and Cobra himself perishes in a fire. Synopsis: Sirdah demands that Wambi repay his debt by bringing him two fawns and one piglet to eat. 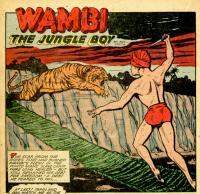 Wambi gets the animals and places them on the opposite side of a ravine from Sirah, with himself in the middle of the rope bridge across the ravine. Wambi challenges Sirdah to cross, but fearing that Wambi would cut the ropes of the bridge, he declines. Synopsis: Brief natural histories of several species of lemur. Synopsis: As future king of the Waneesis journeys to the village of his birth, he is killed by N'togi, who then impersonates him to the Waneesis until he is exposed by Princess Zandra. 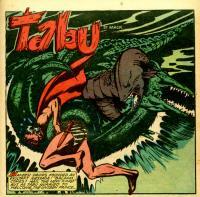 Tabu arrives in time to prevent N'togi from killing Zandra and frighten N'togi into an electric eel pool. Synopsis: Madigan, a renegade, learns of the Wasulis bird god legends and disguises himself as the god. He orders the Wasulis to drive all white from the jungle with the intention of acquiring all the trade rights for himself. 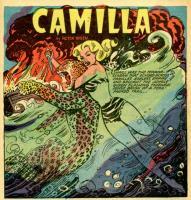 The Wasulis make captives of two hunters who are rescued from burning at the stake by Camilla who then exposes Madigan. He is then killed by the Wasuli. Credits: Script: ? [as Victor Ibsen] | Pencils: Nick Cardy; Bob Lubbers | Inks: Bob Lubbers ? ; Nick Cardy ?